According to the Gloucester Daily Times author Nick Curcuru, More than 250 rowers turn out for 21st annual Blackburn Challenge. He took a moment to interview Echo rowers Jack Tatleman and Rick Klajnscek. 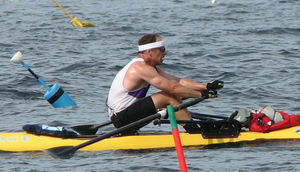 "Jack Tatelman was looking to stay healthy and challenge himself after beating prostate cancer. 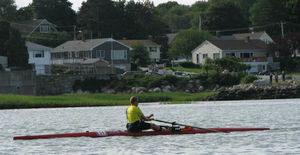 Tatelman, a Marblehead resident and member of Marblehead Rowing Club’s Rock and Row team chose rowing to keep him in shape. To challenge himself he chose to participate in Saturday’s 21st annual Blackburn Challenge.... "
"...Rich Klajnscek President of the Cape Ann Rowing Club, is happy that the popularity of this event is growing. “I am very pleased to have this event in Gloucester,” Klajnscek said. “It is getting bigger every year. Right now it is the biggest open water event in the Eastern United States.”..."
While the official results are not yet posted from BlackburnChallenge.com, Curcuru includes tentative result times in his article. We will post official results when they become available. Reminder- Isle of Shoals Race tomorrow! Class 1 and 2 recreational shells only. Gate opens at 7am. Race kit and charts will be distributed at the Fort Foster gate (entrance fee charged). While we wait for official results to be posted for the Blackburn Challenge, we thought you'd like to see the video & some of the wonderful photos we captured during the race. These and many more will be posted on our website soon. Race co-founder Mark Gorman claimed the overall title in the inaugural Sitka Sound Ocean Adventure Race on Saturday, June 16th. Mark was in an Echo Islander. 1. Mark Gorman, Sitka, male, Echo Islander 3 hours, 26 minutes, 38 seconds. 2. Steve Reifenstuhl, Sitka, male, single kayak, 3:35:37. 3. Matthew Turner, Sitka, male, single kayak, 4:08:05. 4. 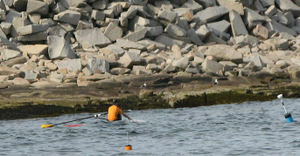 Sandra West, Kodiak, female, single scull, 4:22:55. 5. Andrea Thomas and Cindy Edwards, Sitka, female, double kayak, 4:29:38. 6. 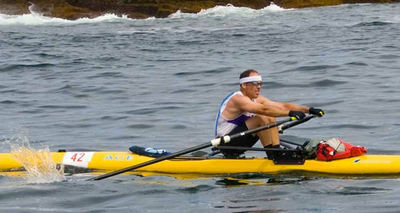 Paul Gloe, Sitka, male, single kayak, 4:29:57. 7. Rick Peterson, Sitka, male, single kayak, 5:04:19. 8. Matthew Keiper, Sitka, male, single kayak, 5:15:32. 9. Eric Haseltine, Sitka, male, single kayak, 5:58:00. 10. Charlotte Pittman, Sitka, female, single kayak, 6:24:10. On rIght: Sandra West participated in her red Echo shell. 1. James McGowan and Ivy Hammons, Sitka, mixed, double kayak, 2 hours, 34 minutes, 25 seconds. 2. 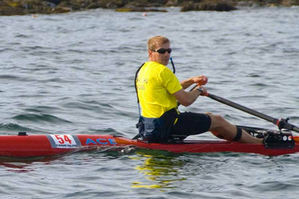 Lon Garrison and Peter Gorman, Sitka, male, double kayak, 2:38:04. 3. Tim Fulton, Sitka, and Eugene Eichner, Couer d’Alene, male, double kayak, 2:44:00. 4. 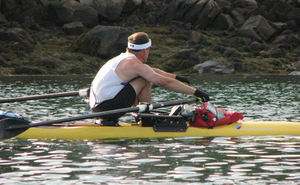 Scott Harris, Sitka, male, single kayak, 2:48:40. 5. Toowú Latséen, all Sitka except Martin from Juneau, mixed, Tlingit warrior canoe (Erin Kitka captain, Carolee Martin, Alexei Desatoff, Bert Stromquist, Mike Pountney, Dave Nevins, Josh Poindexter, Clancy Boord, Kyle Stiefel, Kathy O’Gara, Amiee LeBlanc-Gloe, Linda Speerstra), 2:52:14. 6. Bob Cita, Juneau, male, single kayak, 2:55:19. 7. Litia Garrison and Nancy Knapp, Sitka, female, double kayak, 3:03:45. 8. Kaasadá Heeni Yaakw’, all Sitka except Boucaut from Adelaide, South Australia, mixed, Tlingit warrior canoe (Alison Dunlap captain, John Dunlap, Renae Mathson, Vienna Vaden, Sonya Hoffay, Charlene Hoffay, Steve Johnson, Rose Boucaut, Kara Lunde, Elsie Wilson, Chatham Vaden), 3:04:22. 9. Ed Conway and Emily Conway, Sitka, mixed, double kayak, 3:08:45. 10. Mary Chambers and Amy Blair, Sitka, female, double kayak, 3:12:10. 11. Bill Foster, Sitka, male, single kayak, 3:24:04. 12. Heike Hüttonhofer and Patricia Campbell, Sitka, female, double kayak, 3:31:05. DNF. Donna Russell, Salt Lake City, Utah, female, single kayak, withdrew. DNF. Edith Johnson, Sitka, female, single kayak, withdrew.